Oil workers in multiple states around the country, as In These Times has reported over the last two weeks, are on strike for the first time in a decade. 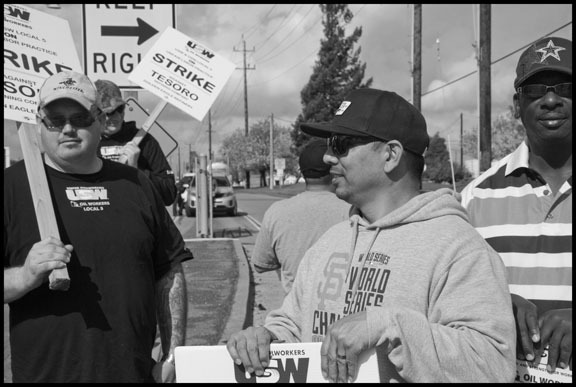 One of the central locations for this strike has been California, where workers at multiple locations have been on the picket line. Jim Payne is financial secretary of United Steelworkers Local 5, the union for oil workers in northern California, including the struck Tesoro Golden Eagle Refinery. Tracy Scott is a rank-and-file worker at the refinery, currently on leave to work for the local as a staff representative. How did the strike come about and what are the issues the union is striking over? Payne: The companies had been making economic proposals, but they weren't addressing any of our proposals on fatigue risk management, contractor facility maintenance or health and safety. They were also unwilling to accept our "no retrogression" clause, which has been in our contracts for years. That clause protects our language about successorship, safety, plant closures, layoffs and rate retention. We're just not willing to go backwards on those things. In the last hour before the contract expired, the company walked away from the table and was unwilling to continue talking. It left our national leaders no choice but to start the strike at nine locations nationwide, and this past Saturday at a couple of other locations as well. We're striking three Tesoro refineries on the west coast, the Shell Deer Park refinery and chemical plant are out, three Marathon plants are out and one LyondellBasell. Now two BP plants have been added. They're definitely the ones with all the resources. It's been 35 years since we've been on strike, so we don't take strikes lightly. But sometimes you've got to do what you've got to do. It feels a lot like David and Goliath. They continue to operate their plants, although not as safely and efficiently as when our members are operating them. They're still making money, even though our folks aren't in there. You're a worker at the refinery here, Terry. What does it mean to be on strike? Scott: I've been an employee since 2000. I was an operator in a hydro processing unit. We basically process feed stock and take the nitrogen, sulfur and metals out of it. Then it goes to a "cat cracker," which turns it into gasoline and other components. 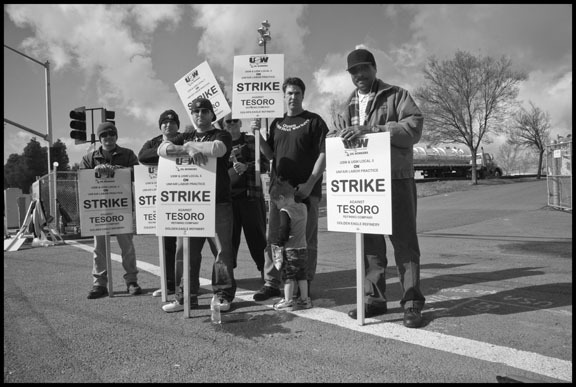 Striking means facing all the hardships any family would expect to see without a job. As a union, we tell our members to save and be prepared. We have a really young workforce, though, and they're not as much into saving as they are into living, so that concerns us. But we have a strike and defense fund that will help those who need it to get through this. We're doing pretty well right now. Is the Golden Eagle refinery operating right now? Payne: Any time we serve strike notice, we offer the company a safe and orderly shutdown. Tesoro here accepted the offer, so we negotiated a process and then took the plant down sequentially. The company is still operating portions of the plant as a terminal, taking product in and sending product out. But they're not manufacturing any product. Golden Eagle is the only one shut down this way. Tesoro Anacortes and Tesoro Carson are still operating. We made sure we were striking over unfair labor practices. Because of that the company can't replace our folks permanently. But they can replace us on a temporary basis, and at all the other ten locations management is continuing to operate the plants. What does "no retrogression" mean, and how does it affect rank and file workers? Payne: The most important agreement that's covered in our "no retrogression" language is successorship. That means that if a facility is sold, it's sold with a contract and the new owner has to honor it. Without that language, the new owner wouldn't have to hire the employees at that location. We've had a number of locations sold over the past years. I can imagine how bad it would have been if that language hadn't been there. The Tesoro refinery itself was sold several times. The last two times it was sold with the successor language in place, so the contract went with it. Scott: Having gone through three separate owners, it's extremely important that we're protected in those events. The fact that the companies haven't wanted to put "no retrogression" on the table is pretty telling about where they're coming from. Based on my own union involvement, without the protections of the successorship language, chances are I wouldn't be there. In the Bay Area in the last 35 years since the last strike, we've seen a number of industrial accidents, some of them pretty horrifying. What does the health and safety language in the contract mean in terms of the actual safety of people on the job in the refineries and in the communities around them? Payne: One of our current proposals is on fatigue risk management. We agreed three years ago to adopt the American Petroleum Institute recommended practice #755, which lays out a maximum number of days and hours. But companies manipulate the schedule to take advantage of exceptions in these recommendations. If a refinery is well-staffed, meeting those standards isn't that difficult. But when you have a company running with a skeleton crew, it's harder. So when they start manipulating people's schedules to meet an arbitrary guideline, it creates even more fatigue for them. When they had the explosion in Texas City, the Baker panel report said fatigue was one of the factors that led to it. A lot of things that go wrong in this industry can be connected to fatigue. Scott: We've been after the industry around health and safety since forever. This time we put out some really serious proposals and we find it difficult to accept that the companies only want to address the financial portion of the contract. Yes, everybody wants better wages, but our intent was to negotiate for a safer workplace this time. Most of the companies' responses made no change. In essence they were just words on a sheet of paper that will have no effect out in the workplace. How do the companies' contracting out practices affect health and safety in the refinery? Payne: We get a lot of specific training on what we do out there. Contractors can be working in one place one day, and then in another area the next. They get only a basic level of training to come into the refinery. Over the years the companies have compensated for the attrition of the USW membership by backfilling with contractors. The level of training has obviously dropped off because of that. Where the companies have contractors who have been on the job a year or more, we want them to fill these positions through company hires. Relying on a better trained proprietary employee would give us better plant safety. We actually had two incidents [occur] in a relatively short period of time. Two proprietary employees were burned with acid, and a month and a half later the same thing occurred with contractors. The company cancelled a safety program in the years before. We've seen the health and safety regulatory data, and the numbers are going up. A safer work environment for our members dovetails with what's provided for the community. If the frontline workers are safe, then the community is safe. I think the community appreciates that, and it's why we've had people coming out and supporting us. 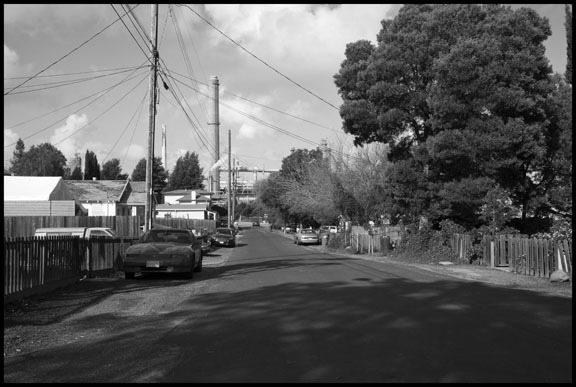 In the Bay Area the refineries are all located in the middle of urban areas with lots of people living around them. Payne: If I were living in those communities and our language protections were stripped away I'd be concerned. We're seeing a lot of environmental and community organizations on the picket lines, but I don't think the general public has as good a grasp on our issues. Most people assume that workers go on strike for more money. But here money isn't really the issue here. We have letters of agreement that provide health and safety reps and other programs that have made things safer. Without the "no retrogression" provision in the contract those could all go away. Tracy, how are you participating in the local negotiations? As a rank-and-file worker, can you bring in your experience of these health and safety issues? Scott: I get time off from work to participate. Our contract provides leave for people to do this, up to a year at a time, with extensions. Health and safety is where it starts for us, but on a local level we're not talking about the policy questions that have us out on strike, and at the national table the companies aren't even giving them serious consideration. They just want these issues to go away. 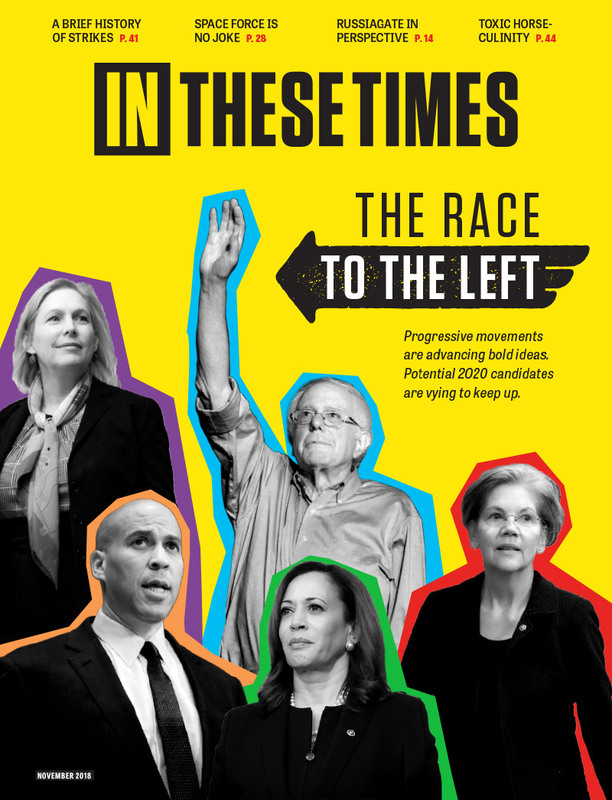 But it's not the '60s and '70s anymore, and we're not going for it. We all go to work to make a living, but in making a living we all want to come home. In part you're right...which emphasizes my point; i.e. - if you don't work to satsify your employer's needs, then eventually he's going to look elsewhere. But to make a blanket statement that "causing employees harm and suffering doesn't matter to them" flys against all logic and reality. Do you REALLY believe that employers - ALL employers! - "don't care" about causing their employees harm??? If you do - and I hope you don't - can you understand why, if employers knew you held that belief, they'd want to have nothing to do with you? Anyway, I don't know if "no employer wants an employee" or not....but I can flat guarantee that no employer wants an "employee" like you! Think that's a given! Don't know where your getting your "information", but it's generally assumed that the U.S. has either the first or second highest statutory corporate tax rates in the world. That, coupled with the fact that - almost alone amongst the industrialized countries - the U.S. taxes profits made abroad as well (if repatriated) has one heck of a lot to do with jobs going abroad. You're wrong about the tax rates. The US has the lowest tax rates of any industrialized country. And Obamacare has nothing to do with it. Zip. Zilch. Nada. No employer wants an employee. Employees cost money. If there is any way they can get away with running a business with as few employees as possible, they will do it. Doesn't matter what industry you are talking about. Employers consider employees to be an evil necessity and expendable. Causing employees harm and suffering doesn't matter to them, beyond the financial costs of having to deal with it when it happens. This is why we have unions and labor laws. The market and the prices have been disconnected for years. Have been ever since the speculators moved in and took over price controls, by hoarding crude in offshore tankers and land-based tank farms, as well as buying up paper futures on oil they are not required to take delivery on. That's Big Money for you. To blame it on the unions and labor is disingenuous and disgusting. No, with the drop in crude prices, they're all running scared, cutting back a lot more. There are highly effective training programs available, but they don't want to pay for it. And, again, "so?" If the unions can't protect their members jobs - which one would think would be their primary responsibility - then they still will have failed! Being competitive is a neccessity, any way you look at it. Whether it's by reduced wages and benefits for the same labor output, or increased (effectiveness) labor output for the same wages and benefits, it's a reality that has to be dealt with....even by unions. If they can't deal effectively with that reality (as obviously they haven't...otherwise why would that jobs have moved? ), then what's their reason for being? Any way you cut it, unions have failed their members - and the nations economy generally - over the past few decades. One can make arbitrary assertions about the "middle class" all day....but my contention is that there's essentially NO economic "class" without jobs. And eliminating jobs seems to be about the only thing generally over the long term that unions have been good at. If you think I'm wrong (and no doubt you do...smile!) show me just how generally unions have PRESERVED and maintained their members jobs over the past decades.....bearing in mind that it really doesn't matter in that context as to "how" or "why" they dissappeared; only that unions have not been able to prevent their dissappearance. That is mostly because of corporations moving jobs and factories to mexico,china,vietnam and other 3rd world countries. They don't have ti pay as much in wages or any benefits. See the FOXCONN (apple contractor in China) series from a few years ago for the reason why US is losing the middle class and all newer jobs (outside of the oil patch until recently) were minimum wage. But, again, over the past few decades, the primary characteristic of union membership has been the likelihood of LOSING one's job! Is that the type of "protection" you're speaking of? Face it; if unions are supposed to "protect everyone", then they've failed miserably. Statistically, over the past 30 or 40 years, you would have had a better chance of "protecting" your employment if you did NOT belong to a union. It usually has nothing to do with job performance, it is about not being a company yes man. The union contract protects him from being fired for no reason, but that does not mean it can't happen. the union gets a bad rap for protecting pieces of $hit (which it does more often than I like), but it protects EVERYONE. It is typically the company and not the worker that is looking to cut corners. You say that the worker has to screw up badly to have a material impact but you are not taking into account all of the things we notice ahead of time that can be fixed before they become a problem where the refinery comes down and trust me it happens on a regular basis. Virtually all the profits come from the difference between the cost of crude and the price the refinery can sell its product. That means the market controls the profits. The only material impact the union worker can have is if he really screws something up and takes the refinery down. If the unions would police there own making sure all thier people do quality work and don't take short cuts they could really add value. If the productivity level is so low how do you explain record profits? Are you under the impression that these places operate themselves? Do you work in a refinery Ken? You seem to have a awful lot to say about what you think it is that we do. The bottom line is accountability. No language no accountability. These big companies can get away with whatever they want to if the language does not exist. They still have the power to manage their people even if they are union. The productivity has been hampered by their own implemented processes. Not by safety. Safety and work is relatively easy to do with proper management. The problem is to many meetings and not enough managers that actually get in touch with the worker. When you have a planner, a scheduler, a front line supervisor, a material expediter, and 2 or 3 other managers above him that are over 20 workers and the managers are not very good at managing them. The workers tend to end up doing most of the managers work so that slows the process down. A team is only as good as the coach. Think of what you're saying for a moment. I.e. - "the company often sees the employee as a threat". In other words, THE EMPLOYER DOESN'T WANT HIM! So what should it do? Continue to provide wages to someone it doesn't even want around? Is that the way you would conduct your PERSONAL business? I.e. - if you have a maid who doesn't do her job, or someone who doesn't cut your grass to your satisfaction or whatever, do yo still hang on to them and KEEP ON PAYING THEM?!? Face it; this guy isn't an "employee" in any realistic sense of the word anymore, because the term "employee" would indicate that he is *IN* the "employ" of an "employer"; i.e. - functioning as the employer wanted and directed! But, by his own admission, he isn't doing that....the employer doesn't even want him there! Now maybe this bozo can live his life like that; i.e. - maybe he has no shame, and feels comfortable staying on and taking wages as nothing but a parasite. But, as such, he's only contributing further to the "union" stereotype. There is a serious shortage of skilled labor and it's going to get worse. If these union employees are truly talented, they will have good paying jobs with or without a union. The current productively level of union refinery workers is terrible. My guess is the refineries are ready to re-tool with people dedicated to quality and get rid of the union if they can. Wages and benefits will remain good for people with talent. When organizing (or heavy involvement with) a union the company often sees the employee as a threat. The employee is often scrutinized and watched closer than anyone else. Everyone makes mistakes and his/her's may be better documented and used to remove him/her from the employed group. "Based on my own union involvement, without the protections of the successorship language, chances are I wouldn't be there." ...in that I wonder WHY he wouldn't be there? If he is/was a competent employee and an asset to the enterprise, wouldn't a new owner WANT him over someone untrained and inexperienced? Or does he make that statement realizing that any future employer - seemingly the same as his current one - WOULD NOT WANT TO EMPLOYEE HIM! That, rather than considering him an asset to the company, he's in truth a LIABILITY? They may claim all sorts of reasons behind the strike they want, but let's face it; these strikers are people who realize that, on the basis of the actual market value of their labor, they're dramatically overpaid....and if an operator wasn't coerced into it, it's unlikely that they'd even have jobs, let alone receive the wages and benefits they're receiving now. With the general public less familiar with traditional union issues, articles like this are very important. I really like how you explained the safety aspects and wish they were more prominently featured in the article. Leading with jargon that the general public is not familiar with ("The companies had been making economic proposals, but they weren't addressing any of our proposals on fatigue risk management, contractor facility maintenance or health and safety. They were also unwilling to accept our "no retrogression" clause, which has been in our contracts for years. That clause protects our language about successorship, safety, plant closures, layoffs and rate retention") probably lost a fairly large number of readers. It's ok to say that, even in jargon, but please don't lead with it. Safety is the compelling story that even citizens who don't work for the refiners or chemical firms need be aware of here and jargony issues should be at the back of the article rather than the front.